Once upon a time Arthur's old page was getting incredibly out of date, so I made him this new one. I thought it looked so great, with such a beautiful picture of Arthur in both the banner and the background. Then something happened -- this page became out of date as well! 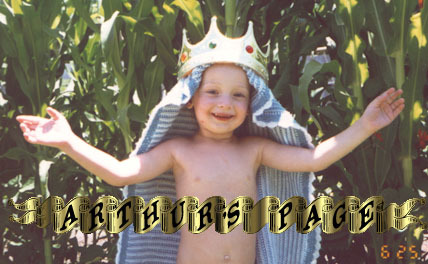 Arthur (born September 20, 1994) is now more than twice the age he was in the picture above. We'll have to come up with a new look, though it's sure going to be hard to leave this one behind. Anyway, here's a list of some of Arthur's favorite things to do. The pictures below (click them to see larger versions) are also getting on in years, but the text is more or less up to date. Arthur learned to read when he was three and has been reading up a storm ever since. He and his brother Sam generally spend hours a day reading and being read to. Right now (March 3, 2001) Arthur is rereading the Harry Potter series for the who-knows-how-manyeth time. Some of his other favorites have been the Oz books, Mary Poppins series, Dragonling series, Swallows and Amazons series, Tintin and Asterix, Nate the Great series, Enchanted Forest series, Groo the Wanderer, Calvin and Hobbes, E. Nesbit books, books with cats in them, Martin's Mice, Bunnicula series, Mr. Putter and Tabby series, Magic School Bus books, Little Bear series, Pippi Longstocking series, Scrooge McDuck comics. When I recently (February 12, 2001) asked Arthur what his favorite games were, he gave me this list: "The Hobbit, ElfQuest, Lord of the Rings, Sorry, Rummikub, Five Crowns, Settlers of Catan, Serenissima, Harry Potter Uno, Cities and Knights, Pirateer, Downfall, Risk, Monopoly, Wicket the Ewok, Lego Time Cruisers, Math Race and Spy vs. Spy." 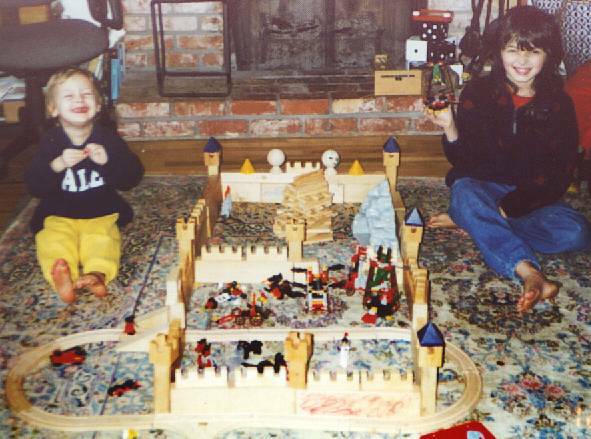 Arthur and Sam love to build block castles in the living room -- this particular one actually stayed up for over a month, and was home to the Lego Fright Knights as well as having a Brio train track running through one of its rooms. Arthur inherited Sam's old P100 system (after having inherited his old 386 system some years before that :-)), but he doesn't actually use it all that much. 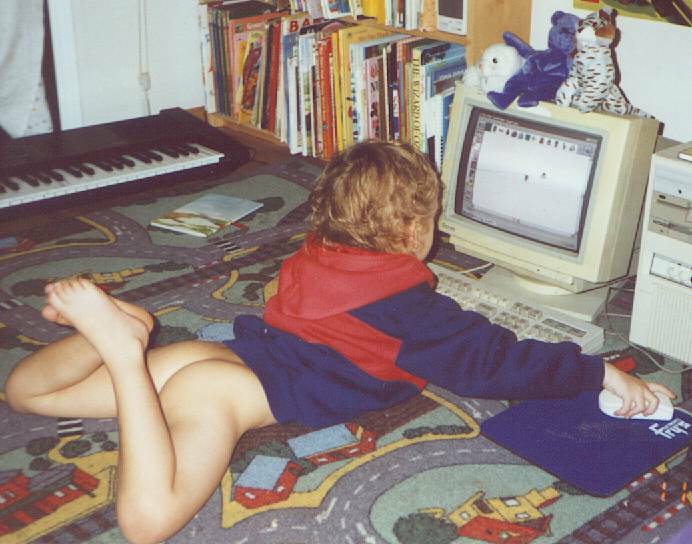 Most of his computer time is spent on Sam's computer, among other things helping to test the games Sam programs and also programming some of his own -- this 1997 picture shows three-year-old Arthur (where has the time gone?) programming a Star Wars game, dressed in a typical Arthur outfit. One type of game programming (though not the only kind) Arthur and Sam have done a lot of recently is to program "puzzle sets" for the "MESH game engine" -- if you click that link you can see some mentions of their names and descriptions of their work in the "EXTRA PUZZLE SETS" section near the bottom of that page. Arthur and Sam love to build things with Lego and Duplo blocks and play out adventures with the Lego and Duplo people. 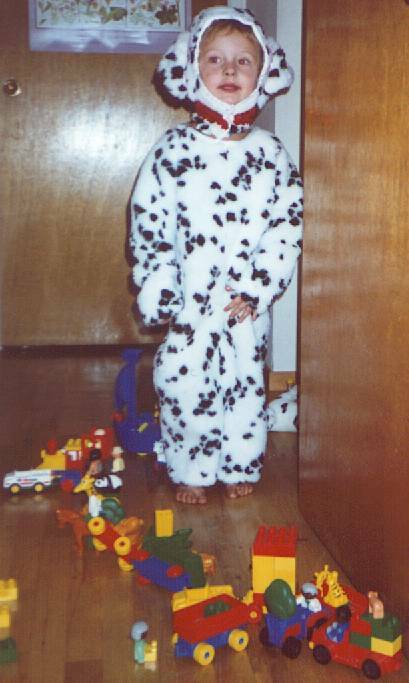 Here you can see Arthur in his 1997 Halloween costume, surrounded by various Duplo people, animals and vehicles. And if you're brave you can also check out this list of Sam and Arthur's Lego sets. After having his heart set on a camera for many many months, Arthur got a little JamCam digital camera for his fifth birthday (September 20, 1999). Click the camera picture to see some of the pictures he's taken with it. (Though his photo page is yet another page in serious need of updating). Words cannot describe how much Arthur loves cats. :-) He loves playing with his and Sam's own cat Lady Katrin, playing with the neighborhood cats, petting (and counting) cats he meets while going for walks, reading books about cats, writing stories about cats, etc. He liked to build with blocks, Legos and Duplos, and he also liked the computer (Klik & Play especially). He liked all sorts of games, such as Board games, Card games and Dice games. He insisted that it was his job to open the door if he was awake. He often played with toy cars and most of them had names that were always changing. He liked music, whether it was playing it or hearing it or singing it. In the year 1998 he first helped with the gardening. (Well ... breaking dirt clods and putting compost on the seed beds.) He liked painting and other kinds of drawing. 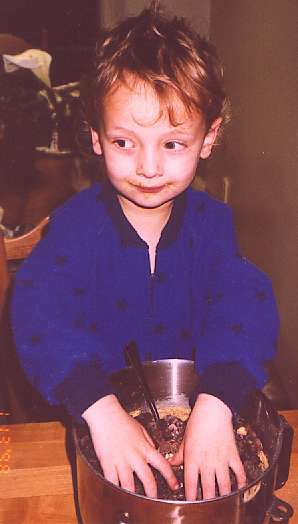 He liked to bake and eat his produce (the batter too). He often played with stuffed animals and his doll "Baby". He loved writing stories and letters in Word. By 1998 he could spell things like Zoom, Art, Jon, Sam, Cat, Dog, Zoo, and maybe even Bee. He liked to record himself on computer and he loved to dance. He liked to put stickers all over and had his own address stickers. He inherited his own computer from Sam. It would take too long to say all the things he liked to eat and drink. After a Star Wars party for Sam's 9th birthday he loved lightsabers (in this case lightsabers are long balloons in something that has a resemblance to a lightsaber handle). Books were one of his favorite things. He liked outside things from cats to trampolines. He liked candy and Bazooka gum comics.